Photography workshops for every enthusiast. 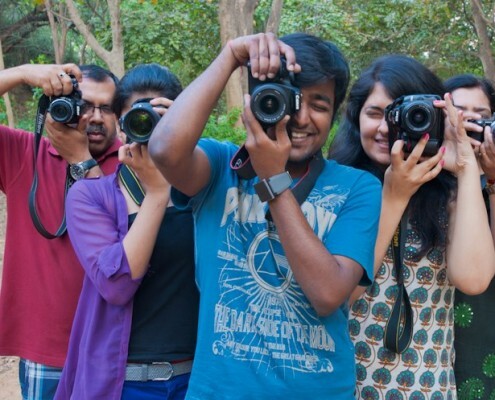 Delhi Photography Club was setup with the intent of taking photography homes. The purpose of the DPC is to stimulate, enable, and nurture a fraternity of photography enthusiasts for mutual benefit. Due to fast changing internet and mobile devices space, many more people are consuming photos. We want people to store their memories more beautifully. The club is perhaps the first initiative of this kind in the entire country. To offer situations to practice photography, we do free photo walks every month. For learning the technique, we have workshops for various levels (beginner and intermediate), for motivation, we offer memberships and finally for platform, we have these exhibitions. The club also helps the under-served children to express themselves creatively through its outreach activities. As a club, we have brought together businessmen, diplomats, doctors, lawyers, homemakers, students and children and helped them in their creative expression using a camera. If you are planning to buy a new camera, or if you have bought the camera recently, or if you are juggling with your camera functions to get the desired results out of it, then the Beginners Photography workshop is the solution. At Delhi Photography club the Beginners Photography Workshop have been designed keeping in mind the basic requirements of the people who are Amateurs, Beginners, Enthusiasts, and the Hobbyists in photography and they want to tame the art of photography in an informed manner. The unique content offered in the workshop is the compilation of the long discussions and brain storming sessions and keeping in the mind the needs of the photography enthusiast at different levels. Remain assured that we will be serving you the best of the quality content carefully tailor-made to suite your requirement s. And it is in synchronization with the experience of our subject matter experts and faculty members. We are equally passionate as you as we all are joined by the common thread of photography. One can take photography any day despite of any age, weight, waist or any interest be it indoor or outdoor. Unique content designed by experienced faculty in an informed manner to help you understand easily. Delhi Photography Club conducts Beyond Auto Mode Workshops, for those who can spare time only on weekends. Take advantage of these workshops to learn different aspects of photography in just a day’s time! A unique 1 day workshop specially designed for beginner and photography enthusiasts to express themselves creatively using photography. An easy to follow and practice workshop that will help you use your camera beyond its auto-mode functions to let you express yourself creatively. A picture is what you saw and therefore, you should be the one deciding on how to capture it, not the camera. Fee: 1800 rupees (inclusive of all taxes) and loads of enthusiasm! If you want to develop an eye in photography, if you are aiming for big, if you desire to develop a thought process in photography, then this photography course is meant for you. This is an intermediate level workshop, which is meant for you if you are clear with your basics in photography and is keen to attain a next level. We don’t teach you about what the camera can do but, what you what you can do with your camera! Payment can be done in instalments in case of higher amount. Fee: 25,000 rupees (inclusive of all taxes) and loads of enthusiasm! • Know the basic settings and functions of your DSLR (Digital Single-Lens Reflex) camera, its benefits and essential items in your DSLR kit. • Functions covered— Aperture, Shutter Speed, ISO, white balance, Focus (Theory and practical) Metering and Flash. • Various other functions of a DSLR camera, and how to control them to create the ‘WOW’ effect. • Learn principles of exposure. • Learn how to create story with using focus and then technical part (Focus points) and its practical. • Learn to use manual focus. • Know how exposure varies with different metering modes. • Learn the types of white balance and its use in various lighting conditions. • Understand color temperature and how it is used. • Your photos become eligible for showcasing in the club events. If you love to travel, if you love to photograph while travelling, if you are bored of your routine job, if you dream of leaving the boring lethal routine, and work for your passion of travel and photography, then Delhi Photography Club organizes travel photography club, meant specially for you. At Delhi Photography Club, we ensure that you won’t need to do your routine job after this workshop. You can take up travel photography on your own. Understanding the use of various light sources and optimizing their usage. If you have decided to venture into wedding photography, why not polish your skill set first? DPC organizes 3 Month long Wedding Photography course, exclusively for those who want to use photography as an alternative source of earning and excel in the domain of wedding Photography. Here is the solution to brush-up your skill- set and to reach bigger audience with your style of candid wedding photography. Lighting techniques for various forms of wedding. Fee: 45000 rupees (inclusive of all taxes) and loads of enthusiasm! If you have bought the camera recently or have finally decided to learn photography, you are at the right page. DPC organizes a variety of workshops on Photography, exclusively for those who want to use photography as a medium to express themselves creatively. A Platform for Beginners , Amateurs , Hobbyists and Enthusiasts. Every month we host 2 Beginners Photography Workshop, One Beyond auto mode workshop, 4 workshops on Basics of DSLR, Understanding Exposure , Metering and White balance and Understanding Focus. Every three month a new batch of 2.5-Month foundation course starts with 7-8 students and two specialised courses on Wedding and travel are also organised. Couple of advanced and topic specific workshops are also hosted like Workshop on visual literacy, Workflow and editing in Lightroom, Understanding the photoshop and so on.